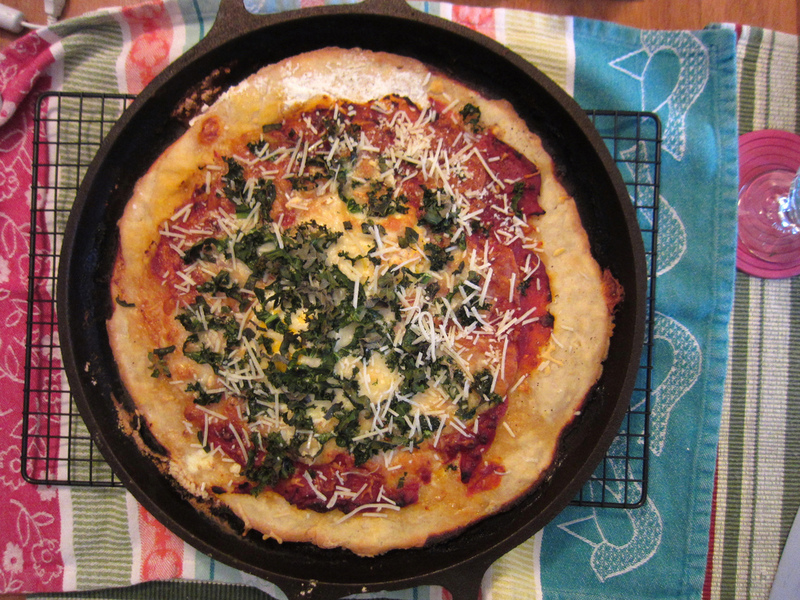 This recipe was inspired by the Pizza Sagra at—you guessed it—Sagra Trattoria and Bar. Now that Eric has mastered the fine art of a crispy thin crust pizza, we decided to try one at home, complete with our not-so-secret favorite ingredient: eggs! The first time I ever encountered the eggs-on-a-pizza thing was at Pizza Express, a chain in the UK. Their Fiorentina pizza with spinach, grana padano, garlic oil, black olives, and a cracked egg blew my mind. This is how unsophisticated my palate was! So, you see, I’ve actually come a long way! (Besides, I never said I was a role model.) And now I’ve convinced Eric that eggs are the ultimate pizza-perfecting ingredient. First, make Eric’s Easy Pizza Dough. 1. Preheat oven to 300°. Meanwhile, drizzle one half of the olive oil on the pizza stone and spread with your fingertips. 2. Next, take the ball of pre-made dough in your hands, and spread it out on the stone so that it covers the whole thing thinly and evenly, curling up at the edges. You can make the crust as thin or as thick as you like, but for this recipe (and according to my personal taste), you will want to spread it comparatively thin. 3. Once dough is evenly spread on the stone, bake it in the pre-heated oven for 10 minutes. 4. Remove the stone from the oven and turn up the heat to 425°. Meanwhile, spread the remaining olive oil evenly over the dough using a spoon. Next, spread tomato sauce. Crack the two eggs over the pizza, and add oregano, salt, and pepper as desired. Bake for 10-15 minutes. 7. Remove the stone from the oven; add mozzarella, basil, and kale, and return entire to oven. Bake at 425° until the crust is brown and crispy around the edges and the center looks firm. 9. Carefully remove the pizza from the oven, sprinkle the parmesan over it, and let it cool for a few minutes. Cut with a pizza cutter or wheel, then serve immediately. You won’t have any leftovers. *Enough to cover the pizza, as desired. Here, we used a couple of mozzarella balls, sliced and spread out over the pizza. You could grate it if you prefer. This entry was posted in Budget, Family, Homegrown, Italian, Mains, Recipes, Vegetarian by Susan. Bookmark the permalink.